Along a gravel rural road a motorcade of well-primped socialites and inked hot guys make their summertime pilgrimage to Jondal Beach's Blue Marlin Beach Club. An equally hot valet points and waves you into a long parking lot facing a single-story all-white beach club. Inside, a massive open-air lounge is arranged in chic tufted-leather sofas and armchairs with a Soho-meets-Bali vibe that envelops an on-site beach shop and massive outdoor terrace overlooking the bay. By day Blue Marlin is all about the beach, opening at around 10am for a late breakfast crowd that make their way to several rows of reservation-only sun loungers where they disrobe to reveal perfectly chiseled, perfectly tan bodies. The restaurant shouldn't be overlooked, equally convenient and delicious, the menu impresses with seafood and super model delicacies. 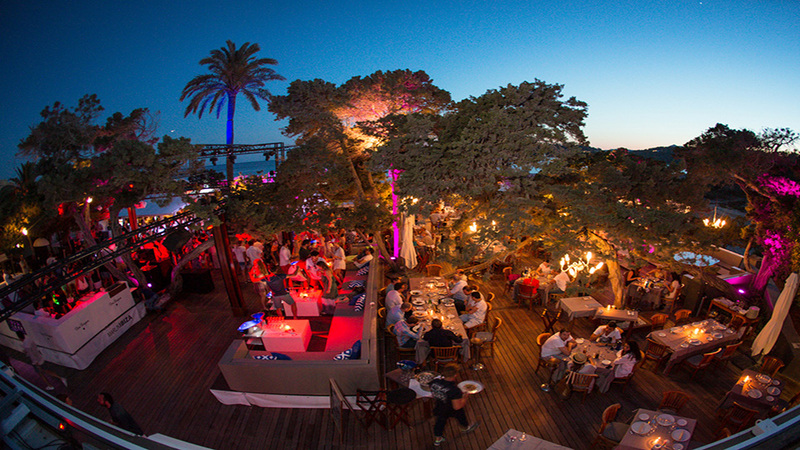 At night the space comes to life as an open-air lounge and nightclub with shirtless DJs spinning funky tunes and mashed mixes till 6am during high-season. Daytime is fabulous pretty much anytime. Nightlife is best Thursday through Saturday, especially during high season when everyone rolls in around 9pm before hitting the island clubs. One of the best beach clubs on the Mediterranean, Blue Marlin offers an all-day destination for lounging, swimming, eating and dancing by the sea from 10am till sunrise. Be fit or at least dressed to impress (casual, stylish beachwear), especially if you don’t have a reservation for a lounger.